ROMULUS facilitates the processes required for the registration of refugees and provides comprehensive security and coordinated within the auxiliary equipment. In connection with the current refugee situation states and cities are called on to implement security solutions in auxiliary equipment and refugee camps. The here presented »Out of the Box« concept »ROMULUS« facilitate the necessary processes for the registration of refugees and provides comprehensive security within the auxiliary equipment. On this page you learn more about Romulus and its modular design and its integral components. For questions or interests – just get in contact with us. Reporting and review of services such as food, clothing, etc. Interfacing to a location center or the Internet, the system a xDSL / UMTS / LTE contains router including firewall. The firewall supports strongly encrypted VPN compounds which can be used both for remote maintenance of ROMULUS system as well as to connect remote, secure subsystems – for example, governmental portals, people databases, etc. The ROMULUS Flighcase brings an integrated WLAN hotspot. 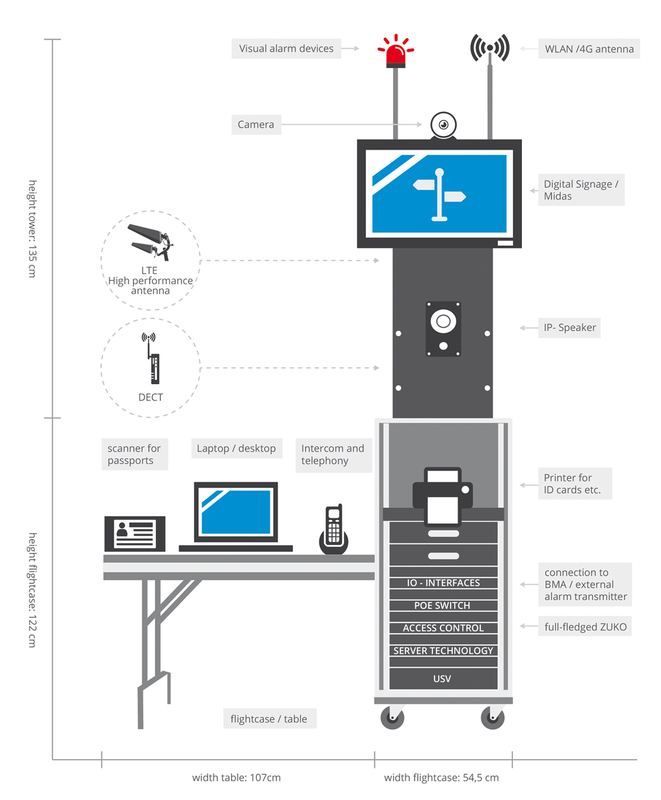 Thus both mobile workforce with tablets and smartwatches are connected, as well as remote parts of the infrastructure such as IP speakers or cameras. Optional an open hotspot for residents can be connected. Both WLAN structures operate separately and have no direct transition between them. 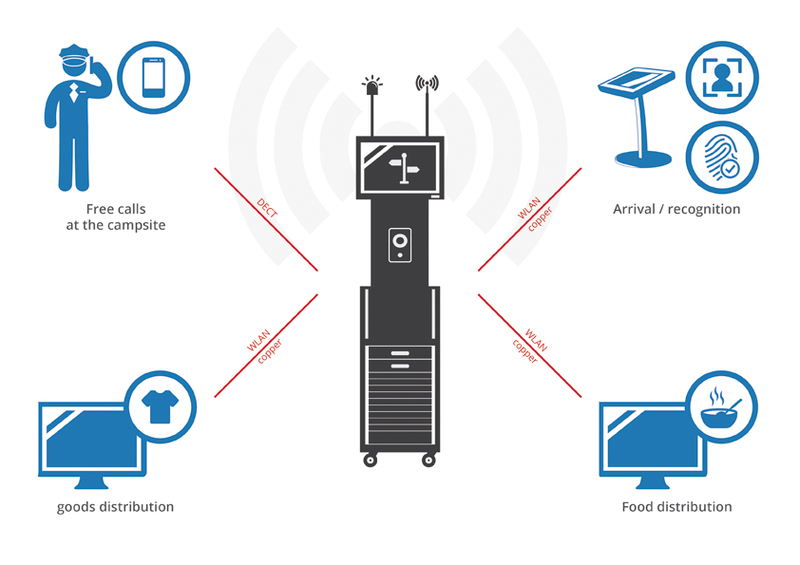 Due to the fact that refugee accommodations are often built in renovated but (from ITK view) infrastructure poor buildings, the concept brings also a complete DECT based telephony system with it. DECT has the advantage in enclosed buildings to operate robust and reliable. Furthermore, the supplied handsets protected all IP65 and feature a long battery life. The telephone system can be connected via a VoIP trunk to the public telephone network or a superior authority. For the efficient handling of potentially hazardous situations, a complete alarm server is implemented. This is not only in case of fire and other evacuation situations for use, but are also the local staff the opportunity to become noticeable in attacks. In case of alarm the announcements in German, Arabic, English and French on the supplied IP-speakers are played. Tripping can optionally take place automatically via a locally existing fire alarm system. The »Dublin agreements« allow the acquisition of biometric data for refugees and asylum seekers. A fingerprint is effectively the only unique feature which leads every refugee or resident with him. The Biomietrie is also used by food and goods expenditures hedge against social fraud. As far as identification documents are present, they can be processed by machine. This serves both the working optimization for detecting employees, as well as the optional verification of identity documents for accuracy or query in external (public or private) databases. Because often lack language skills all the inhabitants are not capable of communicating with the local staff. Here are interactive terminals a great help. Furthermore, these can be used to display menus or routes cards interactively. The system here is also multilingual. The terminals or panels are in case of an alarm to interactive escape route indicators. To increase the safety of employees as well as the monitoring of home furnishings that video technology module is available as an option. Moreover this to any necessary remote diagnostics can be undertaken in escalation situations. 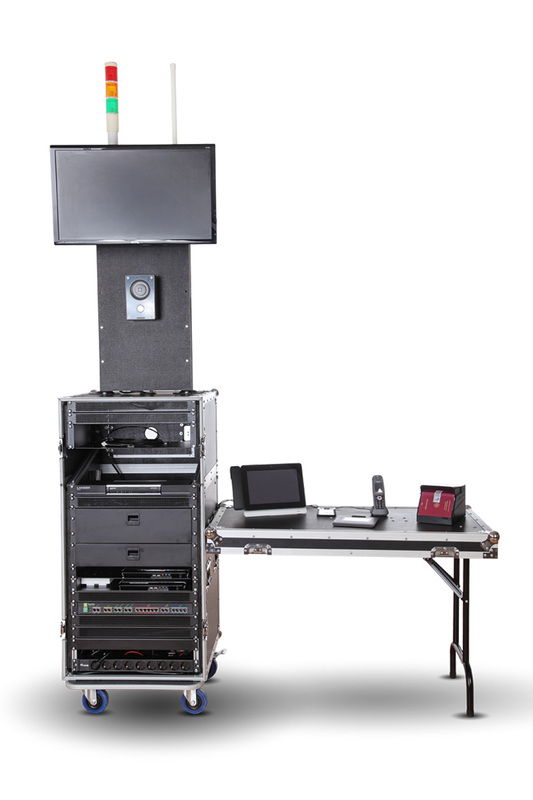 The system can be expanded by a detached single solution with a few IP cameras, through to a full video system. For an orderly flow of dispensaries of food, clothing, or other goods, the ROMULUS Flightcase contains interactive terminals. Coupled with the biometrics an exact allocation between beneficiaries and the flow of goods is possible. Further downstream, a real-time analysis and reporting to any supply can be realized. The flightcase is protected against unauthorized access. It features a tamper circuit on the access panels or via a vibration sensor. The system can be expanded to a complete security system, which for example, the server room monitoring. The alarm notification may be made via siren, SMS or voice call. 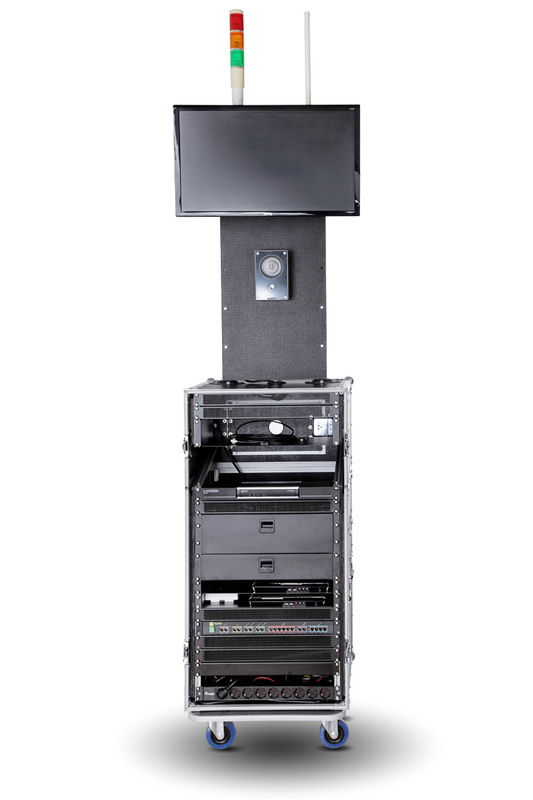 To secure special areas (storage, social rooms of employees) and for detecting the presence of all the local people in the building, the ROMULUS Flight Case also includes a complete and full-fledged access control solution. The system is designed to greatest sturdiness. It constitutes no rotating parts and is designed for temperatures between -10 ° to + 60 °. 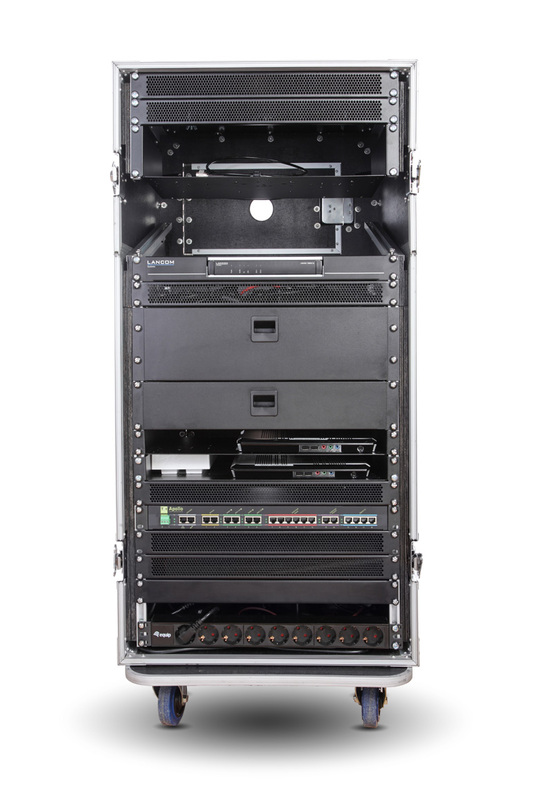 For the “ROMULUS Flightcase” exclusively industrial components are used, which high loads and harsh environments withstand. The power is supplied via a conventional 220 volt outlets. 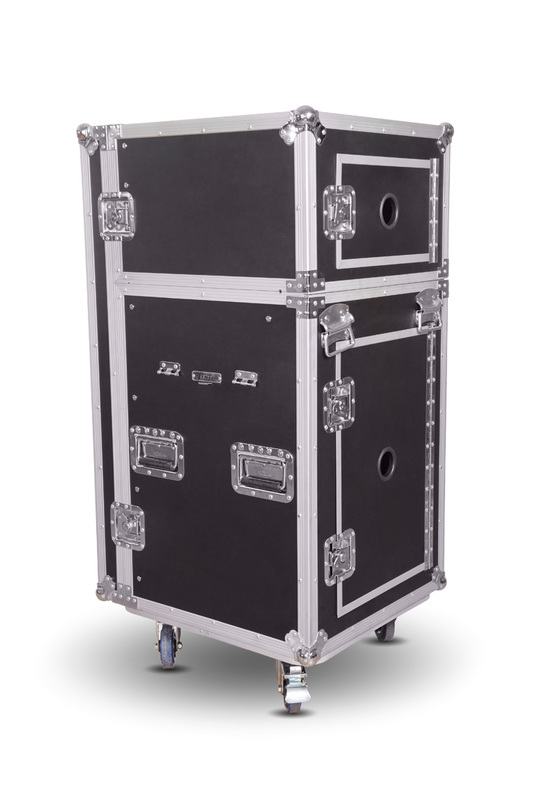 Optionally, the flight case can also be running on generators. The optional USV ensures enhanced operational reliability. 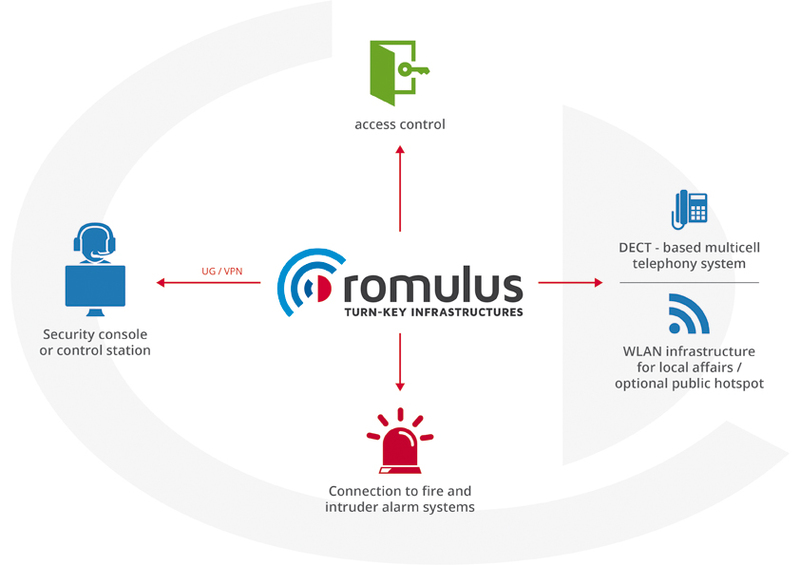 You want to know more about Romulus and experience the possibilities of using? Explore our ROMULUS story. To learn more about the processes such as the registration of refugees, food and goods distribution and alarm and evacuation. Do you have to have any questions or looking for a specific solution? Write us via the contact a message. We will contact you and advise you!